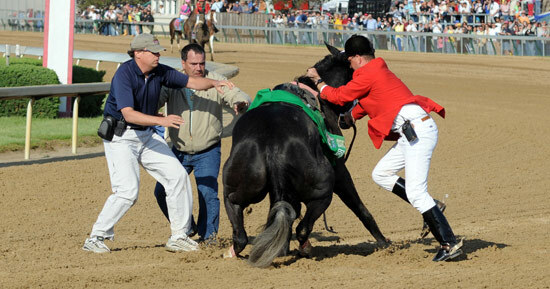 Eight Belles was euthanized on the track at Churchill Downs, breaking down just minutes after she finished second to Big Brown in the 2008 Kentucky Derby. Eight Belles broke her cannon and sesamoid bones which led to her ankles collapsing, said Dr. Larry Bramlage, the on-call veterinarian for the American Association of Equine Practitioners. That is the same type of break suffered by 2006 Kentucky Derby winner Barbaro in his off hind eventually leading to his death. Photographer Unknown. What Parker was referring to is the bane of horse racing in today’s syndicated commercially-driven industry where money, greed and short-term gains preside over the welfare of the horse. A shift in the industry in recent decades and the maniacal frenzy for speed at the expense of durability and soundness has all but decimated a once genetically diverse and robust species. Over time, especially in the last four decades, the manipulation of the gene pool of the Thoroughbred and relentless inbreeding at the hands of unscrupulous breeders has created inherent weaknesses in the bloodlines that have led to dangerous flaws in physical conformation. In the tragic case of Eight Belles, Parker had identified a series of foreboding crosses stemming from a line notorious in the Thoroughbred breeding world for unsoundness. “What so concerned her on the eve of this Derby, what she found so disturbing, even infuriating, traced to her unshakable belief that Eight Belles was carrying in her DNA the seeds of her own destruction. “Specifically, in the pedigree of this speedy gray filly, Parker had seen the same kind of dangerous crosses — in her case, lines of known unsoundness triply crossed behind an unsound sire line — that she believed had contributed to the racetrack breakdowns and deaths of such prominent horses as Ruffian and Go For Wand, of George Washington and Pine Island, and even of Barbaro. As it happens, today’s Thoroughbred population is so saturated with the blood of Raise a Native’s sire Native Dancer – speed at the expense of endurance – the threat to the viability of the breed is in question. As an example, all of the starters in the past three Kentucky Derbys (2008, 2009 and 2010) carried the gene pool of Native Dancer, many of them multiple times. Moreover, the blood lines of the current 2011 Derby contenders are equally infused with Native Dancers volatile genes, some of which ominously parallel the pedigree of Eight Belles in terms of the degree inbreeding and multiplicity of crosses. This proclivity for the Native Dancer bloodline is not limited to North America but rather persists throughout the entire global Thoroughbred industry. It is widely understood that the ancestry of the Thoroughbred dates back over 300 years to three foundation stallions – the Darley Arabian, the Godolphin Arabian and the Byerly Turk – hailing from North Africa and the Middle East. During the 17th and 18th centuries these stallions were bred to select mares, native to Britain, and so began the process of selective breeding. To continue reading, click the page numbers below . . . . Previous Post New Premarin Study: Benefits continue or dangers continue? i agree Suzanne, i was watching when this horrible tragedy happened i will never forget Eight Belles , this kind of disaster makes my blood run cold, this one could have been avoided…..to run mares against , geldings or stallions should never be allowed in the first place a mare will run herself to death just to beat a stallion…………… This is fact and all thew trainers know it……………………….. Rest in Peace Beautiful Eight Belles……….. This is not only heartbreaking, it is infuriating – just like so many other things that are happening to our horses. And, sadly, I haven’t a clue as to what to do about it. As long as the God Mammon is worshiped to the exclusion of everything else by those who control the futures of our breeds, things can only get worse. I have NEVER watched horse races for fear of what I might see. It’s bad enough to read about it and see pictures. To watch it happen… I can’t stand it. Things like this make me ashamed to be a human. I had never seen this actual picture before, how very very tragic. I remember Robby Albarado saying, at the time, it was the worst thing he had seen in horse racing. And I believe he was right. RIP Beautiful EIGHT BELLES. You will NOT BE FORGOTTEN. The pictures of the horses that gave their lives for the sport of racing are some of the most heart-wrenching of the many atrocities that are committed against the horse. Of course slaughter is ultimately the worst. Why does this continue to happen? It is the lowest of low that we have cast upon the noble and ever-trusting animal that the horse is and has been since the dawn of time. Too painful to think about, at least for me.